The capital Moscow is one of the world’s greatest cities and due to the vast size of the country there are terrains of every kind, a variety of weather from the coldest city in the world like Yakutsk to the sub-tropical beach resorts of Sochi. Russia is entrenched with a marvellous history and there countless museums you can visit to learn about it, especially in Moscow. Moscow is a bastion for museums and architecture. 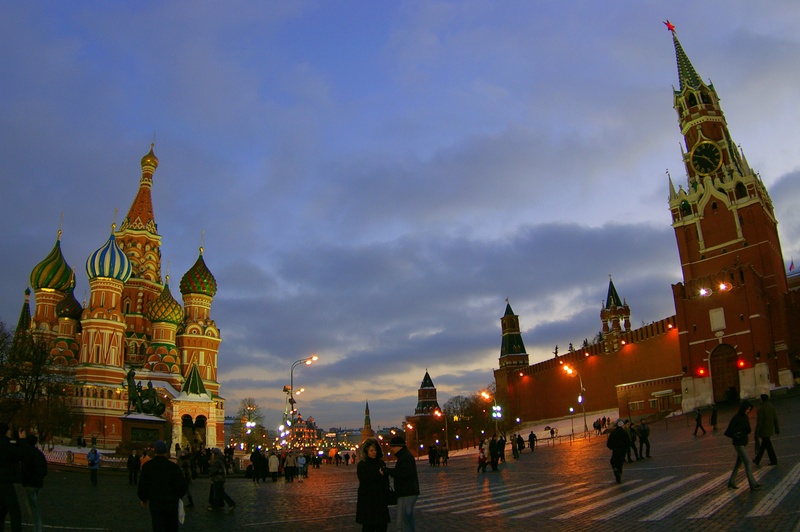 The first port of call for tourists will be Red Square (pictured) that lies at the heart of the massive capital. Students of history will be in awe of one of Communism’s great leaders Lenin, who has a monument dedicated to him. Further down tourists will be reaching for their cameras again to take snapshots of St. Basil Cathedral built in 1556. Try and get inside to the museum for a sneak peak if possible. Russia’s rich history dates back millennia but tourists cannot escape the lingering shadow of communism that has held sway over the country since 1917. It took many forms such as Leninism, Stalinism and Trotskyism but the prevalent theme always centred on state authority and a classless society. The Soviet Empire included much of Eastern Europe at one point until the break up of it in 1991 under Mikhail Gorbachev. Tired of history? Then why not make your way down to Bolshoi Theatre and catch a play for a thousand roubles? Those lovers of art need not feel left out (even if you are few in number), as Tretkayov Gallery will see to all your creative desires. For those wanting to experience the local food, head to Park Sokolniki where you can sample the local Shashlik, a wonderful duet of Russian and Georgian Kebab. The location is also an amusement park and will keep the kids entertained for hours on end, as will the odd beach resorts. Sochi is a Black Sea beach resort and packed with Russians. It is gaining in popularity and is set to host the Winter Olympic Games in 2014, which will surely provide great advertising for the place. Some people may get enough of this is their home countries so why not head on to Siberia if such is the case. Siberia is often referred to as a hellhole because of the amount of Russian dissidents that were shipped off there under Joseph Stalin. But look beyond that and you will find a region brimming with gorgeous mountainous scenery and serene lakes. It is very swampy in the north and centre but if it’s natural beauty you’re after, Siberia will cater to your wants.